Edward East carried out one early statistical study of poly-genic inheritance on the length of flowers in tobacco (Nico-tiana longiflora). He obtained two varieties of tobacco that differed in flower length: one variety had a mean flower length of 40.5 mm, and the other had a mean flower length of 93.3 mm (I Figure 22.15). These two varieties had been inbred for many generations and were homozygous at all loci contributing to flower length. Thus, there was no genetic variation in the original parental strains; the small differences in flower length within each strain were due to environmental effects on flower length. When East crossed the two strains, he found that flower length in the F1 was about halfway between that in the two parents (see Figure 22.15), as would be expected if the genes determining the differences in the two strains were additive in their effects. 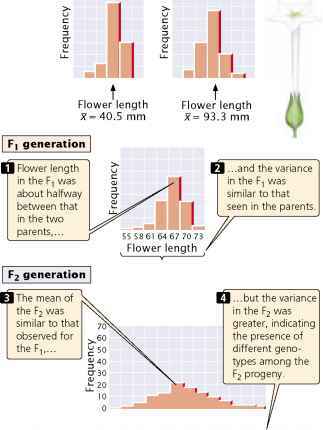 The variance of flower length in the F1 was similar to that seen in the parents, because the F1 were, like their parents, uniform in genotype (the F1 were all heterozygous at the genes that differed between the two parental varieties). East then interbred the F1 to produce F2 progeny. The mean flower length of the F2 was similar to that of the F1, but the variance of the F2 was much greater (see Figure 22.15). 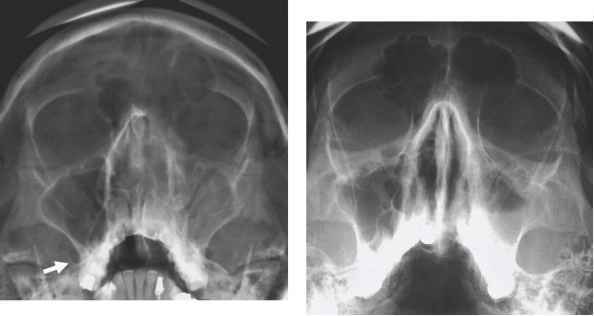 This greater variability indicates that there were genetic differences within the F2 progeny. 122.15 Edward East conducted an early statistical study of the inheritance of flower length in tobacco. parents. This finding demonstrated that flower-length differences in the F2 were partly genetic and thus were passed to the next generation. None of the 444 F2 plants that East raised exhibited flower lengths similar to those of the two parental strains. This result suggested that more than four loci with pairs of alleles affected flower length in his varieties, because four allelic pairs are expected to produce 1 of 256 progeny (1/44 = 1/256) having one or the other of the original parental phenotypes.